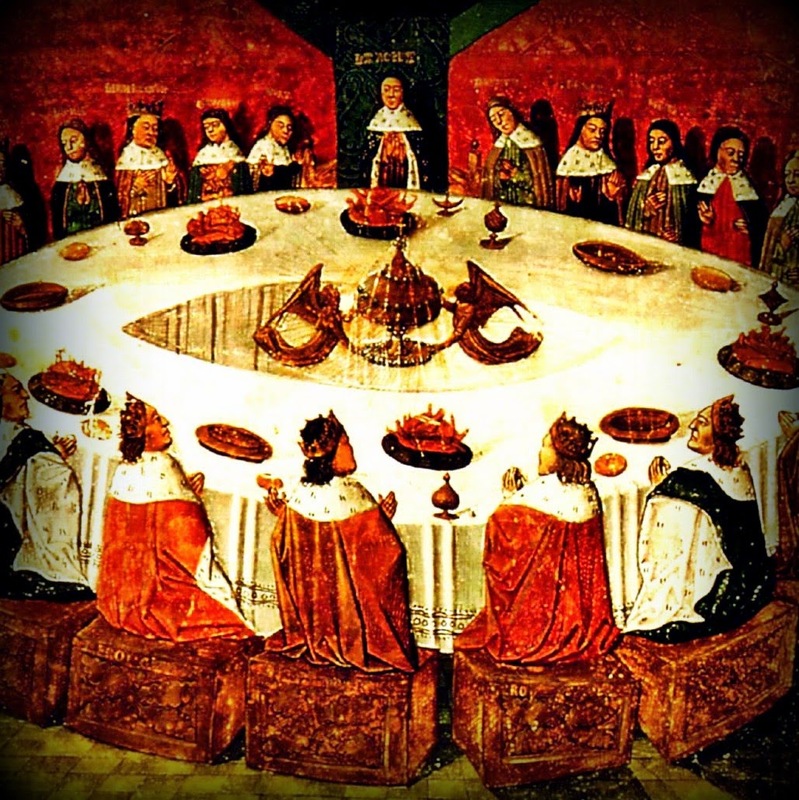 "How We Are Made Whole by Relationships"
As I pass through Thomas Malory's Le Morte D'Arthur, I find the King crying on his Queen's shoulders at the pledge that the Round-Table will follow the Quest for the Sangrail (tales all about inconstancy & being-made-whole). The tears are because King Arthur knows that his collection of friends and family will be separated by this quest and when they all return back together, it will not be the same community. Usually, I take the position of protecting "Parts" from "Wholes," noting that "Wholes are often antagonistic to parts" and that there is an importance to "Parts as Parts." It is one, for instance, to consider an amputee as a whole within herself. It is another to consider her a part without a sense of holism, a sort of ontological free-agent. However, as disability studies is not simply about affirming the dignity and liberty of people with disability, but also about assisting in the care and betterment of all manner of lives, there is a value in considering the restoration of a whole as a potentially desirable and valuable trajectory. Being able to come back together as a community after departures is critical to a sense of self. "The Restoration Narrative" (as Arthur Frank has argued in the Wounded Storyteller) towers above all our desolation, leaving us with the sense that a "integration" or "cure" will be compulsory; thereby erasing our sense of self & dignity in our part-ness. How do become whole without losing the important parts of ourselves? "The Quest Narrative" (appropriately named by Frank) often incorporates a return to a kind of wholeness, but while sustaining difference and process as parts of what it means to be whole. To accomplish this narrative, we need to redefine wholeness in such a way that does not simply replace or subordinate the importance of parts. As we consider: (1) What is a whole vs a part; (2) Why being whole matters; and (3) How we can form better wholes, we can shed light on our own friendships and sense of wholeness. To begin, I have found it useful, for myself, to illustrate these three points on a white-board. A key principle to understanding my new approach to "the Whole" in such a way that does not erase the importance of "Parts as Parts", is that I regard the Whole as a Part. What makes a "Whole more than the Sum of the Parts" is that it is arrived at by adding together all the parts and then adding "the Whole" part which is what constitutes these otherwise separate organs as unified as some kind of singularity. I've used the metaphor of the skin before, where without it the parts are visible as parts, but the skin adds a sense of aesthetic unity. Likewise with the casing for different kinds of technology. Sadly this does often erase the visibility and thus our evaluation of parts. I find clear casings for electronics to be interesting for exactly the reason that it somehow twarts the sense of wholeness by emphasizing the object as a hybrid of many parts. But I will go further in my definition of "the Whole" and I hope open up new possibilities for considering the values of Wholes vs Parts: Wholes are Relational Parts. We have often regarded the Parts purpose as servicing the Whole, providing distinct qualities, objects or services, but the Whole services the Parts as well by bringing them all together and setting the terms of their relation. Hobbes's Leviathan attributed the Part of the Whole to the King, who sustained and ordered the relations of the other Parts that make up the Kingdom. Now, Kingdoms are not popular here and now, but perhaps we could understand them and ourselves differently. Do we need Kings (or Queens)? Do Parts Need Wholes? Yes and No. It depends on what you want to do and be. In one sense, we can (perhaps) be King-less, Nation-less, and exist as free-agents in an Chaotic Anarachy of Individuals. But is this not to say that we are each Kings or Queens of ourselves? Is not the benefit of being a Part that we can de-part from this Whole and form/join that Whole? What we arrive at by the revelation that every Whole (or King) is also a Part, and that every Part is on some level a (Whole), is that we one some level Relate and on another level Retreat from relation --- here we might see a correspondence with Graham Harmon's "Real" and "Sensual" objects. The Whole is that part of us that makes us "us," or me "me." The Parts are those parts of us that allow for us to also be "them," or me "you;" such as when I talk about my friends or organs as separate-able from myself. Wholes are important to consider separately from the Parts, just as Relationships are important to consider from the Partners, for very similar reasons. When things are going well is useful to remember that in a Relationship there are the Partners and then there is another thing which is the Relationship itself. Making a Partner happy is great, but that doesn't always lead to a happy Relationship. Relationships take work and consideration on their own terms. Being with your Partner may be nice, but having points, such as Date Nights where you emphasize The Relationship is also important. Celebrations, Conferences, Retreats, Meetings, Ceremonies, etc are all testaments to the helpfulness of regarding the Whole in addition to the Parts. Goals are set, plans are made, and the Relationship is assessed and affirmed. Considering the Whole or the Relationship as a distinct Part is also useful when they need to be changed or disintegrated. Being able to say "they are a great person" or a "they are a valuable part" even though "the relationship" or "the union" isn't working is helpful to a certain phase of a break-up, I have discovered. Likewise, when the Relationship needs to change, such as moving from "Friends" to "Lovers" or from "Lovers" to "Friends" it is useful to consider the person as well as how we relate to them; what I have called the Whole. As the Parts or Partners change, often the Whole does or needs to change as well. In other words, as we change, what and how we are together and how we relate to each other change. A Relationship needs to change with its Partners. Again, even if you don't want anything to do with that Part, Person or Whole, this is impossible (or difficult) without being able to say that at some point you were or could have been attached together by some kind of "Wholeness." One cannot be Single or an Individual, without asserting a sense of being a Whole in relation to yourself. Otherwise you may forever be "Dating" or a Part which never quite settles down into a Whole/Relationship. This may be possible. Arthur's court fractures when his knights set out in search for the Sangrail, and this reveals relationships and sub-wholes within the partitioning. The knights compete in clusters, according to ties of friendship or family. Furthermore, each knight is himself a whole made up of different body parts, weapons, armor, horses and likely an unseen retinue of servants; because what Lord truly travels alone with all he has to carry? In looking at how "Wholes" can change along with their Parts, as an-other Part, we have looked at one dimension of how we can form better "Wholes." Another aspect of trans-forming "Wholes" is to recognize that insofar as Wholes relate Parts, so too we may have many relationships and be a part of many Wholes at once. Whether conflicts arise from within or without, parts may need to make demands on the whole if it is going to sustain itself. Be it the mismanagement of Part called Whole (i.e. the King) or the harm being cause on One part by another (i.e another Knight), transformation may need to occur. Failure to accord these changes may result in one Part being removed and a redefinition of the prior whole, and an assertion of independence of the other. An organ may work with the body for a while, but at a certain point the body and the organ may need to be surgically removed to ensure the health of one or both. All of this is to say that being conscious that any given Whole, Friendship, or Relationship depends on the Parts which may consist and coexist within a multitude of other Wholes, compels us to try to regard as many dimensions of our community as possible when conflict arises. Typically the lines of fracture will announce themselves, but often we will have to follow them to see where they lead. Asking, "How is this part-ner's other selves (bodily-health, friendships, romances, family, work-place, etc.) possibly setting competing tensions with our relationship?" or "How do I fit in as a part to their sense of wholeness?" may give critical awareness in conflict resolution. Outside of conflict, such awareness may give us an improved appreciation for Friendships critical relation to our sense of wholeness.